As many of you who have read my reviews in the past would know, I am a huge fan of the HASC concerts and wait every year for the CD and DVD to be released. I got hooked as a preteen and the excitement of hearing and seeing what new “chiddushim” would be introduced has never gone away. A number of years ago, one of my good friends went to visit his grandmother with some friends and she got him tickets to that year’s HASC concert. When he came back he was so excited and could not stop talking about how amazing that concert was. Hearing all about the concert, I too wished that one day I would be able to attend a HASC concert. That friend of mine is now my brother in law, and my wife heard all about that concert as well. When the opportunity came for us to be able to take a mini vacation to New York, we decided that we would go the same weekend as this year’s HASC concert in the hopes that we would be able to attend as well. Boruch Hashem we did! One thing I can now say is “Ayno Domeh Shmiya L’reiyah”, there is no comparison to listening to the concert on CD (or cassette) or watching the concert on DVD (or VHS). Not only did we luck out with an epic and historic concert, but experiencing it live was an amazing experience that we will never forget. Before I get onto the actual concert, I was reminiscing about how long I have been listening to MBD and Avraham Fried. As a young child I remember when MBD used to come to Chicago often in the late 70’s and early 80’s (well I only remember the 80’s but have heard recordings of his performances in the 70’s) and since my parents had the only frum band back then they used to accompany him. I would usually go to the rehearsal and watch him practice for the upcoming show. At home, we always listened to his music on records and eight tracks (I remember specifically listening to “I’d Rather Pray than Sing” on eight track). As an interesting aside, Avraham Fried was part of the backup choir on some of MBD’s early records before putting out his debut album of No Jew Will be Left Behind. Another member of some of those backup choirs was also Oded Graucher (AKA Dedi). With Avraham Fried, I also have memories of meeting him back stage and actually attending a couple of his concerts as a young child when he was accompanied by my parents’ band. I have always loved his voice and agility on stage. Since I have followed both of their careers for so long, and have always loved listening to their music, I was hoping that they would feature a mix of music from all of those years, and thankfully they did. I will go more into detail on that later. Now onto the actual concert. Since my colleague, Kol Isha (whose husband I had the honor to sit next to and he graciously held my hat on his lap the entire time), already gave an in depth review, I will be giving my perspective of how I enjoyed the concert. I got to Lincoln Center around 6:45 and saw people milling around the lobby. When they opened the doors to the hall, people slowly went to their seats. At about 7:25 I was looking around and the room was still very empty. Hearing about how concerts in NY usually start late, I was skeptical on how long it would be until the concert would start. Much to my surprise, at 7:29, Nachum Segal announced that we were starting in 60 seconds! At 7:31 the latest, he introduced Freilich Band and the evening’s overture. Before I continue about the concert, I just wanted to get my one complaint out of the way. The music was way too loud. I was told by people that have been to the HASC concerts before that it is usually not this loud so I don’t know why it was like this, but you could feel the vibrations in your body and the floor felt like it was shaking. I know people who would have enjoyed the concert much more if it had not been deafening. I personally got used to it (I guess all those years of standing in front of drummers and guitar amps have gotten me used to loud noises) and it didn’t take away from my enjoyment. The other observation (and biggest highlight of the night for me) was something that I was quite surprised but also very pleased to see. I know that HASC is all about special children and so when I saw so many of them in attendance (including the enthusiastic young man to my right, Gershon Wertzberger, whose chaperone asked that I mention him in my review) it didn’t surprise me. I also was very touched by all 3 of the videos that starred the special children of HASC. What I wasn’t expecting was how involved they are and how they are incorporated into the show. When the camp chairman (a former counselor himself) went up to present the award to the guest of honor and a camper called out to him. He looked up directly at the young man (who was a couple of rows behind me) and said hi back to him…by name! When Avraham Fried danced up and down the aisles, he danced with them and was giving as many as he could high fives. I could go on and on, but you get the point. It was so heartwarming to see how they are really the focal point of HASC, even when they are in the middle of a huge professional production. Back to the actual concert, after the band was introduced, I was ready for them to start playing, but instead Jim Hynes walked out whistling and then playing on trumpet, the traditional and classic HASC overture that has been so famously incorporated into every new overture that the concerts have featured over the years. In my opinion, it was the perfect (and coolest) way for them to incorporate it before starting a brand new “freilich band” styled overture. I love listening and watching Freilich play because they have such a crisp and tight sound, and this overture really hit the spot for me. The band was a bit smaller than I remember it being in previous years (from videos of course) but there was no need for it to be larger. Led by keyboardist Mendy Hershkowitz (who also utilized his synth sounds plenty over the course of the night), drummer Avrumi Schreiber, and guitarist Nachman Dreyer they were amazing. The brass section featured two trumpets, a trombone, and two saxophones (yes I know they are reed instruments, but for the sake of simplicity I am including them in the brass section). There was also a string quartet sitting up high, but I am not sure how much they played. At least any time I looked up at them, they were just sitting and watching. Rounding out the rhythm section was a bass guitarist and a percussionist. It was a top notch solid band. After the overture, Nachum Segal introduced the first surprise performer of the night, Michoel Pruzansky. I had figured that Hurricane Sandy would get a lot of mention, especially since MBD has been a big advocate for his hard hit Seagate community, but having Michoel sing his hit song, Taaseh, was a very nice tribute to those who experienced the devastation and to those who responded magnanimously to help out in any way. It was very touching seeing the pictures and videos of devastation that ran on the screen behind during the song. Just getting a little side tracked, it was definitely a “mi k’amcha yisroel” moment watching how many volunteers were there to help. Following this song was the real only non-music break of the evening (yep, there was no intermission, just 3 hours jam packed of musical enjoyment) with a few speeches and the first of three videos that featured the campers of HASC. With everyone on the edge of their seats, they ripped down the large curtain that was blocking the band and functioning as the screen for the videos, and Nachum Segal came on to introduce what everyone was waiting for: MBD and Avraham Fried! They both came on stage to thunderous applause and sang a medley featuring two of MBD’s more recent big hits (Ma’aminim and Kulam Ahuvim) and two of Avraham Fried’s recent big hits as well (Hesech Hadas and Ki Hirbeisa). This was the first that we heard from the Shira Choir. They had six of their choir members there and were directed by Yoely Horowitz. I have seen them at different venues and they really bring a certain brand of energy wherever they perform, and this evening was no different. They really show their enthusiasm when they sing! Then it was Avraham Fried’s turn to share his magic with the crowd. He started by belting out the mega hit from his newest album, Hafachta. There was a piccolo solo (from my vantage point it looked too small to be a flute) that mirrored what is played on the album and it was really cute how excited Avraham Fried got during the solo and brought his microphone over. He followed by singing his amazing ivrit song, Rak Tfila. He actually started out by singing without any microphone and with only Mendy Hershkowitz playing a little synth behind him. It’s the same way he sings it on “Live in Israel”, but the electricity in experiencing his live performance was amazing. I also want to point out that the acoustics of the room were amazing, and we had no problem hearing him. I found that very cool (and so did he apparently, because he said he had always wanted to try it and finally did). He also slowed down the song in the middle and added some English words (which was nice because it was a translation of the ivrit words). The rest of Avraham Fried’s set was memorable as well. It is unbelievable how he really works a crowd, gets the crowd involved, and how he just has the perfect personality to have everyone enthralled with his singing and laughing at his witty remarks and stories. His English Medley that I think he called his “Bissileh Chutzpah” Medley, (featuring Don’t Hide From Me, Father Don’t Cry and Keep Climbing) and a Fast/Rock Medley (featuring K’shaym Sheani Roked, Maareh Cohen, and Sisu V’simchu) were both filled with emotion and electrifying. As an aside, he mentioned that Moshe Laufer was in the crowd and that Moshe had given him the song of K’shaym Sheani. I happened to meet Moshe Laufer after the concert in Amnon’s Pizza on 13th Avenue and he loved the concert (or show as he called it). Next came one song that I was really hoping that Avraham Fried would sing, Kach Es Sheli. Not only is it an amazing and rocking song, but I have seen videos of Freilich playing it and they really do the song justice. Avraham Fried took it to the next level by starting out the song slow and adding a heartfelt speech. His last solo number of the night was a tribute in honor of the Baal Hatanya’s 200th yartzeit and he sang a medley of the extremely hartzige Baal Hatanya’s Tzomoh and then vamped into the lebedik Hayma, where he danced up and down the aisles together with some of the children of HASC. I have to say that even when I saw him perform when I was a young child I realized then how amazing of a performer he was, but now actually seeing him now just elevated him in my eyes. He was amazing! As a perfectly placed way to calm everyone down after such an electrifying performance, the next HASC video was shown. This one featured a song that was composed and performed by a camp counselor, Jordan Odinsky. It was a beautiful and touching song. Before I continue with the concert, I wanted to mention something I touched on earlier. The program noted that there was going to be no intermission. Originally I was taken aback by it and couldn’t understand why not. However at one point in the middle of the concert I looked at my watch and was surprised how much time had passed. I think having a 3 hour hit filled concert was just perfect without any intermission, and in a way there was more time for a couple extra songs! Following the video, Nachum Segal came back on stage to introduce MBD as he always has: “The King of Chassidic music, Mordechai Ben David”! MBD came on stage to one of his latest hits, Omar Rabbi Akiva. I can’t remember the last wedding that I didn’t sing that song, but hearing him sing it live was amazing and an unbelievable song for him to start off with. He followed with two medleys that featured a wide range of songs years wise. His slow medley had much older songs (V’ani Tefilosi, a slow Ani Maamin, and Odcha) and his Fast/Rock medley featured songs that weren’t quite that old (Timcheh, Chevron, and Aid Od Milvado), but in relation to how long he’s been in the business, from a while back. For me this was perfect, as I mentioned before I was hoping that he would sing songs from all the different periods of his career. Next MBD sang a song that I remember listening to all the time growing up, Shir Shel Shalom (AKA Song of Peace). I know his voice and range aren’t what they used to be so I was surprised he was able to sing it, but not only did he nail every note, he sounded amazing! Next, MBD sang a medley of his favorite songs: Miracles/Happy Days (with the more modern arrangement from his English Collection album…which I prefer), Lonely People (which he changed the words to homeless people…..there will be no more homeless people….in an apparent shout out to the Hurricane Sandy devastation), the chorus of Just One Shabbos, So Proud (the one song of the evening I did not know but googled later and it is a 2nd English song on “Let My People Go”), Yerushalayim is Not For Sale, Let My People Go, and ended with the chorus of Someday. These songs brought back memories of HASC concerts of past and the crowd really got into it. He then dedicated his next song, Anavim, to the composer and his good friend Yossi Green, and yes, I was also so ready for Yossi to appear and join him on stage (no piano on stage at that point sorta gave it away for me). This is not only a very famous song, but it is very overused so my first reaction was “not again”, but Mendy Hershkowitz proved to me how with just a few tweaks the song could be even more enjoyable. The style of the song by nature is a rock ballad, but he added some major rhythm to it and it was more upbeat and rocky than usual. The song began with a solid guitar solo by Nachman Dreyer and ended with an amazing solo by saxophone virtuoso Shlomi Cohen. With this MBD exited the stage, and the stage crew wheeled on a grand piano, as Nachum introduced the next performer of the night, Abie Rottenberg. What Abie did (once they brought him a microphone) was invite MBD and Avraham Fried back onto the stage and proceeded to have a little kumzitz with them and to extol their amazing talents and virtues. Of course they didn’t let Abie get by without returning the compliments and they also sang a couple of Abie’s songs as well. I know Abie had it all prepared, but it sounded like Mordche and Avremel had no idea what was coming up and it was really cool watching their spontaneity. Their little kumzitz ended with Od Yeishvu (one of my favorite slow songs) and with Abie’s HASC classic, A Small Piece of Heaven. 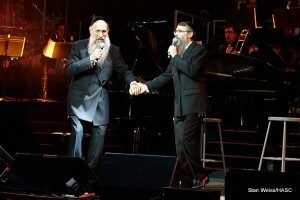 MBD and Avraham Fried stayed on stage as Abie left and told each other (and us) a couple of very cute and moving stories. Their banter between each other was very interesting, and it is very apparent that there is a mutual respect and admiration between the two. Just when you thought the concert was winding down, they mentioned their families and invited MBD’s son Yeedle, and Avraham Fried’s nephew, Benny Friedman, for a medley of their hits. They sang Yeedle’s Shiru Lamelech (who doesn’t know that), Benny’s mega hit Yesh Tikvah (the crowd went “not stam” wild), MBD’s Usid (one of my favorite horas) and a Chabad Nigun which originally was featured on Beri Weber’s latest album and that Avraham Fried has performed live at a number of recent performances. That song got anyone who wasn’t already out of their seats from Yesh Tikvah up, and plenty of people were dancing (so much that the security on my side of the room came to get everyone out of the aisle and back to their seats). They then showed one final video in tribute to the counselors of Camp HASC. Everyone came back out for the Finale featuring Hinay Mah Tov (originally sung by MBD and Avraham Fried at the Ohel Concert 5758), Yerushalayim Oro Shel Olam, and (how could MBD not sing this song) Mashiach! It was an amazing end to an amazing concert. With the few days that have passed since the concert, I am still on such a high from being and experiencing the concert live. I have watched any videos I have been able to find on YouTube (and shown some to my kids too so they could see what we experienced). I cannot wait for this concert to come out on CD and DVD because I know it will be an instant winner in my house. It really was a once in a lifetime opportunity that I will cherish! i know hasc is on a budget but it is disapointing when all those majestic early hasc concerts had huge 60 piece bands, and here we have less than shwekey would have for a regular concert.. however i feel that as long as there are a combination of at least 6 horns ( trumpets sax etc) at least 4 strings then a regular band on top of that is good. i am genuinely really looking forward to this concert and my only one issue is that instead of mbd singing anovim/moshiach/usid/omar r akiva (he sings them at every single concert and no that is not an exaguration), would it really have hurt to add in say hu yiftach or the stoliner niggun or siman tov from the double album? jewish music though – frum jewish music is alive and popular as ever… this concert prooved it! Thanks Chaim. For one thing, the past few MBD albums have songs with much smaller ranges in the and the reason given is always that MBD can’t hit the notes he used to. I am happy that he still could and he sounded marvelous! As far as the size of the band, I have not paid attention to the recent sized bands, but I do remember how large they have been in the earlier years, and also was curious how large it would be with Freilich being the band playing. Regarding the songs MBD sang, I knew that he had to have a mix the old and new songs, and truthfully what other new songs did I want to hear? None! He sang his nicest new songs and a nice mix of old songs too. It didn’t matter to me whether it was part of a medley or not. There were people there waiting to hear his newer music and some wanting his older music and it was a nice mix! Thanks again for responding! Well Chaim, he certainly proved to me that he could still hit the high notes!